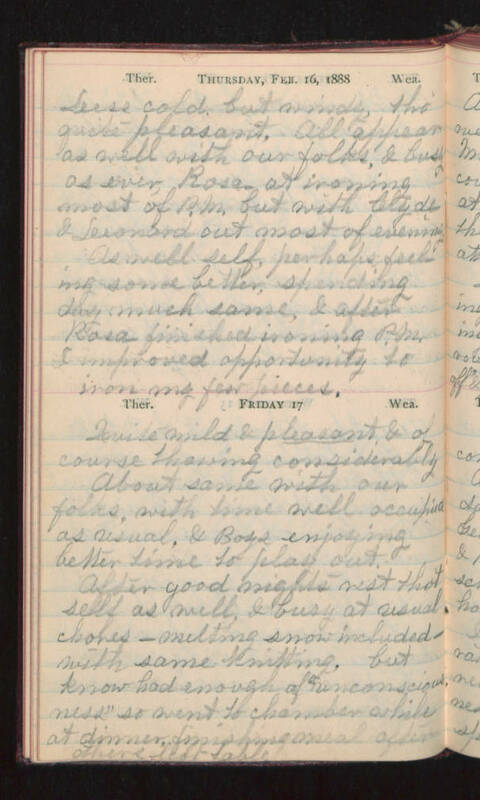 Thursday, Feb 16, 1888 Less cold but windy, tho' quite pleasant. All appear as well with our folks & busy as ever, Rosa at ironing most of P.M. but with Clyde & Leonard out most of evening. As well self, perhaps feeling some better, spending day much same, & after Rosa finished ironing P.M. I improved opportunity to iron my few pieces. Friday 17 Quite mild & pleasant & of course thawing considerably. About same with our folks, with time well occupied as usual & Boys enjoying better time to play out. After good nights rest that self as well, & busy at usual chores - melting snow included - with some knitting, but know had enough of "unconsciousness" so went to chamber while at dinner, finishing meal after others left table.